Made from the same material as the widely popular Super Shammy, this replacement mop head is unmatched for its absorption properties. It is a direct replacement for the head that comes with our Shammy Twist Mop, but could be used on other similar products that use the same attachment method. It can soak up nearly 20 times its weight in liquid, and it won't even drip on the way back to the bucket. The advanced material will lock in the moisture, and all of the dirt, so you can avoid drips and new messes as you move back and forth. It is similar to a string mop head, but has fatter and thicker strips. The material that is is made from is also far more advanced when compared to regular style string mops. When compared to one made from cotton, it will not only hold more water and soap, but it will also do a much better job cleaning your floors. The soft, almost sponge-like material is safe for any flooring surface, and since it is made from synthetic chamois, it can actually pick up light debris as it wipes the floor clean at the same time. Each head can be used over and over again thanks to the easy method with which you can remove it for laundering. This makes it easy to wash, but also quite simple to replace when that becomes necessary. This advanced string mop head offers a better way to mop. Not only is the material extremely effective, but when attached to the mop, it creates a self-wringing tool that is incredibly powerful, and easy to use. The thick and absorbent strips will spread out far to make cleaning easy, and they will remain gentle on any surface they come into contact with. Despite this gentle touch, the advanced shammy material is also incredibly tough on dirt. It will power through build up in order to remove it quickly and efficiently, so any floor will be easy to clean. If you prefer mopping with a bucket, then this mop head, and the tool it fits, is an ideal choice for you. It can hold tons of liquid without dripping, so you can clean up fast, and never worry about making new dirt on your clean floor. This also makes this mop head perfect for soaking up spills or drying wet floors. When you want to release the collected moisture and dirt, simply twist the handle to squeeze it dry. The yucky dirt and brown water will fall down and out of the material so that you can then dip it into you clean water and continue working. Whether you are purchasing a head as a replacement, or you just need to remove yours in order to wash it, following these easy instructions will make it a quick and simple task. In order to get the head off, it is basically a two step process. The first thing you want to do is take off the end that touches the floor, then you will take the other end off, and slide the whole thing off the mop pole. In order to disconnect the first part of the head from the rest of the mop, simply grab the gray portion of pole toward the interior of the head with one hand. With your other hand, you will want to loosen the black plastic connection piece by twisting it counter-clockwise. Once this plastic part is all the way loose, the first end of the head will be free of the rest of the mop. In order to get the other part off, you will sort of just slide it off. Make sure you are moving it toward the top of the mop, and not down toward the connection you just released. There will be little black nubs that stick out from the plastic part this side attaches to. The ones on the bottom side are much larger than the ones on the top side. You will need to slip the head up and over these nubs in order to remove it from the mop. It will be impossible to slide it down, but if slipped up and over the top nubs, you will then be able to slide it all the way up the pole, and off the mop. To replace the head after washing or purchasing a new one, you would just follow the same instructions, but in reverse order. Get the top end in position, and securely in place between the two sets of nubs, then just screw on the other end and you will be good to go. This synthetic chamois mop head is totally machine washable, but you will want to be sure to follow these few pointers each time you send one through the laundry. Although you can wash them in the washing machine, you will not want to dry them in the dryer. If you do, it will result in shrinkage due to the material composition and high heat. Instead, just hang dry after washing, and it can be washed and reused many times with nothing to worry about. When you do wash it, you will also want to be careful with bleach and fabric softener. Bleach can deteriorate the material over time, and fabric softeners of any kind will coat the material over time. Whether you use liquid softener, or dryer sheets, the mop head can be coated, and then lose absorbency, so it is best to refrain from adding these when washing your shammy mop head. Order Yours Today! Strip Dimensions 19.5" x 1.25"
Shammy Mop Replacement Head - A new mop head to revitalize your older product, or add convneinece to one you just bought. Super durable and absorbent, these synthetic chamois mop heads will power through dirt and absorb loads of moisture. Order Yours Today! Absolutely, no holds barred, LOVE these mop heads! The only mop head I have used for over 25 years! Love them, they are the best! Like the product. Quick and easy to use!! I have owned this mop longer that I can remember, its always great, and I own a cleaning service. Lots of wear and tear. I can assure you it has lasted me longer than my marriage of 23 years, I just buy new replacement heads and move on. At Divorce time... he asked for the mop and alimony... guess what he did not get? True story. Love these mop heads. Been looking for replacements forever. Now I found them! Yahoo! The delivery was much later than expected! Good product. Better than original. 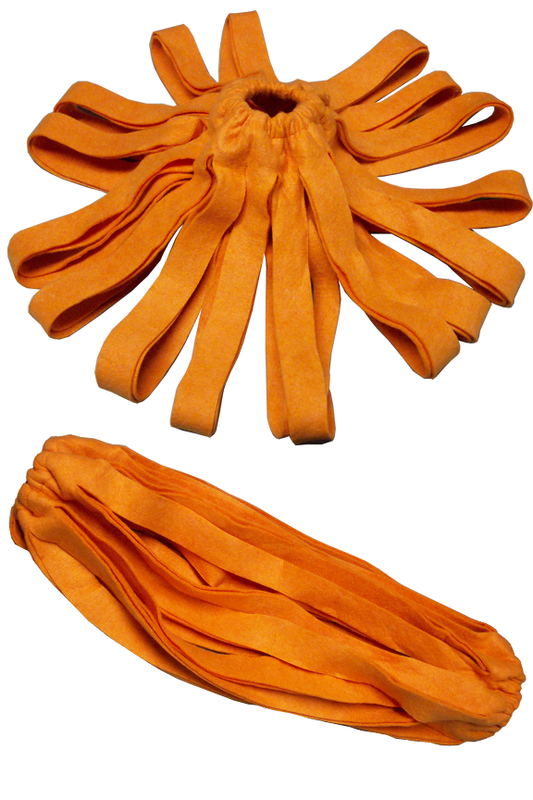 love these mop heads great for the garage floor and sooking up spills. could be a little cheaper. This is the only mop type I have had for years and was thrilled to find replacement heads at such a good price! My wife loves this mop and we have been using it since it was originally introduced. With the new supply of mop heads, it means we are going to keep using it. Maybe forever. Received order in a timely fashion. Good quality at a very reasonable price. The best mop for my floors I have ever used. Soaks up liquid quickly. Very Happy with the Shammy Twist Mop. The staff are very professional. I reported a damaged mop and they promptly send a replacement. Hard to find mop head for Shammy twist mop is Fantastic and a Great price. The Shammy mop is the Best mop i have used. I tried the Crappy spin mop and it was Horrible. The Shammy mop is Tons Better and i was Very Happy to find replacement mop heads. Love this! Cleans my wood floors the best! I've had this mop for over twenty years. Best mop I ever owned. Ordering was easy and shipping was excellent. I really love this mop and there is no where where I can replace mophead. Thank to you that you carried the mophead. The shipment was very excellent. Absolutely you got good stuff that I want. Yes, I love my mop heads. I have been trying to find these mop heads for several months because mine was wearing out. I have used these shammy mop heads for a number of years. I love them and recommend them to everyone. Thanks for being there when I needed you. I don't know why these have become so hard to find... these are great, durable mps that do a wonderful job... no sweeping required beforehand, which is great when cleaning up lots of little spills and messes... once the floor is wet, sweeping is no longer an option. This is a good price for a good product, and it arrived quckly. Absorbs and cleans well. Don't apply too much force when wringing or it will come loose. I was so glad to find this mop head online......The old one I have is at least 15 years old. However, the band is too short to get it over the cone that holds it. I ordered two and got them quickly (thank you), but they are both too tight. Any suggestions? simplygoodstuff response: These can be a little tricky to install, so please give us a quick call, and someone would be happy to walk you through it. I have a Microfiber Peabody & Paisley self locking twist mop refill For # 033MPP. Will this handle fit. Do you carry just the handles? We do not sell the pole by itself, and we could not guarantee it would fit. Sorry. Is this the same as the ones that WERE sold at the As Seen On TV Store? It may be, but we would not be able to guarantee it. It sounds like you have the right mop. There is a black piece with threading toward the inside of the head, and only at one end.